Remember when Google’s Chrome browser overtook Internet Explorer as the world’s most popular browser for a week back in May? And next, for a full calendar month? 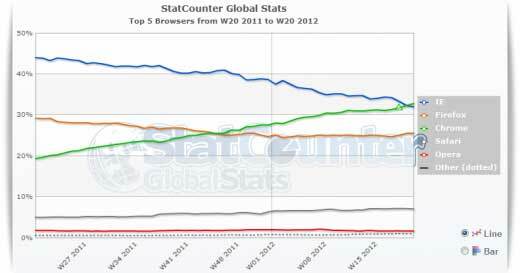 For July 2012, StatCounter pegged Chrome’s global market share at 33.8 percent, up from 32.8 percent in June and from 22.1 percent in July 2011. After months of chipping away at its lead, Google Chrome has finally overtaken Internet Explorer to become most popular web browser worldwide. Mozilla’s Firefox is the third most popular browser with just more than a 25% of the market.